One site auditing a virtual presentation. The presenter is at another site, controlling the screen remotely. Note that the display doesn't occupy the entire screen, and that a minor adjustment of the projector position would probably make things much better. In all likelihood, the presenter has no idea that the image is so small. Thus, even when your presentation makes use of a graphical channel, it's best to assume that at least some in the audience might have some difficulty reading it. Photo courtesy Louisiana Department of Health and Hospitals. The modern workplace, team-oriented for many years, has turned virtual. More people telecommute, many teams are global, and travel costs limit face-to-face meetings. 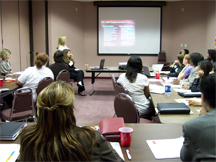 With increasing frequency, we deliver presentations by telephone or Internet. Here are some tips for making your virtual presentations more effective. Mute all audible signals in your environment: telephone, mobile devices, computer, pet macaw and teapot. If at home, disable the doorbell. If in a hotel or at work, use a do-not-disturb sign. Close your office door or find a room with a door to close. If you're connected by telephone, have the highest quality available — avoid speakerphones or mobile phones. Use a headset to keep your hands free. If using the Internet, high-speed connections are best. If using video, check the lighting and have a good quality camera. Use simultaneous Web and video channels in parallel with audio only if the presentation truly requires them. Using video or graphical channels exposes the presentation to technology risk, and that risk should be justified by a need. Have backup channels in case your intended communication channel fails. Prepare to make do without video or Webcasting if necessary by prepositioning materials for the audience to download. Have drinking water available, and drink through a straw if you're using a headset. For your best voice, sit upright or stand. If you need reading material, avoid paper shuffling by spreading the pages on a desk, or tape them to a wall if you aren't on camera. If you're on camera, use a teleprompter or cue cards. Keep a notepad and pen handy. Have your appointment calendar ready. If your audience is following your presentation in written form, announce your place whenever you change to a new page or slide. If some exhibits are documents, prepare them in advance with page numbers, line numbers, internal hyperlinks, and bookmarks to ease direction and navigation. If your presentation is recorded, and if some of the audience is present audio-only, take care to describe explicitly what they cannot see: page or slide numbers, features of graphics, URLs, and other items they might not have. Speaking clearly is always essential, but in virtual presentations, you might be unaware of some competing noise sources, such as line noise and local noise at the listener's location. In the virtual presentation context, you're competing with powerful distractions for audience attention, including email, texting, games, food, and interruptions. Be funny, dynamic, and intriguing. Omit long descriptions of what everyone knows. Would you like to see your comments posted here? rbrenmDxfcBwCpvvwmDKZner@ChacfKhmQUEAGgIXbKGtoCanyon.comSend me your comments by email, or by Web form. If your job responsibilities sometimes require that you tell powerful people that they must do something differently, you could find yourself in danger from time to time. You can learn a lot from tugboat captains. When a team member seems not to understand something basic and important, setting him or her straight risks embarrassment and humiliation. It's even worse when the person attempting the "straightening" is wrong, too. How can we deal with people we believe are clueless on the concept? See also Personal, Team, and Organizational Effectiveness, Effective Communication at Work and Virtual and Global Teams for more related articles. I offer email and telephone coaching at both corporate and individual rates. Contact Rick for details at rbrenlHOrQWIwNffmRqlgner@ChaceogtRTLUgmZfDReMoCanyon.com or (650) 787-6475, or toll-free in the continental US at (866) 378-5470.